With the end of the summer fast approaching and the drizzle of autumn unfortunately upon us (about a month earlier than we want it), there is no denying that back to school season is here! Everywhere you look there are adverts featuring kids and parents getting ready for another year. This week one of our classic leather satchels was featured in The Independent newspaper one of their “15 best school bags”. With all the stress of shopping for shoes and stationary and textbooks, a new school bag may be at the back of your mind. So to alleviate any hassle when searching for your child’s new bag, I have compiled a list of five of our best leather bags for the new school year and do remember that all our bags can be customised with names or initials so the bags will easily find their way back to your loved (forgetful) ones! Our original leather satchel is one of my personal favourites due to its classic style and vintage charm, and it was recently picked by The Independent as one of their top 15 back to school bags so it clearly isn’t just us! It is long lasting, hard wearing and spacious, with more than enough space for an A4 folder, textbooks and a 13” or 15” laptop, and the thick leather will last for many years of lugging homework to and fro! 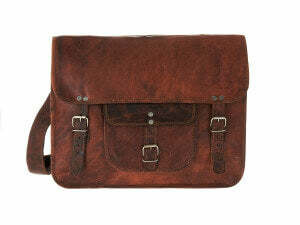 Next on the list is this modern take on the vintage leather satchel. The black leather used updates the classic style so that any child would be pleased to show it off, and not only does it look great, but it can easily fit all the coursework that needs to be dragged back and forth to and from school, and an 11” or 13” laptop can fit inside easily. So for a modern and practical version of a vintage staple, this is definitely a great choice. If your child cycles to work, or perhaps just prefers having a bag on their back, this is the perfect school bag for them. The gorgeous suntanned leather looks amazing, yet there are no compromises on practicality as it can be used as a backpack, satchel, or even as a briefcase! It can easily fit an A4 file alongside books and papers, and a 13” or 15” laptop can also fit inside, so for all the practicality of a large backpack, with the classic style of the leather satchel, this bag will go down great. Similar to the above bag, but made with beautiful black leather and with a top handle for easy use, our large black leather satchel is really one of our best bags for the new school year. With numerous pockets and space for anything that might need to be carried in, and soft black leather that only gets better with time, this is a fantastic bag for anyone in the new term, whether starting in year 7 or heading off to university! So, to all you mums and dads, lets hope your kids have a great year, before we know it we will be shopping for Christmas gifts next! February 14th is Fast Approaching so here is our guide to some of the perfect Vida Vida leather bags, satchels and accessories. If you have been so busy sticking to your New Year’s Resolution that you’ve only just realised that Valentine’s Day is just under a week away, fear not! For all those times I have been in a similar, rushed situation, I thought I would help you out with my top five Vida Vida presents for men and women, whether you’re on a tight budget, or looking to splurge. Just remember to get your order in by Wednesday to be sure of delivery in time. 1. This Tan Leather Card Holder, £20, is perfect if your man is constantly on the move – the beautiful stitching compliments the suntanned leather so well and its size means it can fit inside a pocket easily. If you’re looking for something slightly more substantial, but you love the gorgeous leather, you can see our leather wallets here. 3. 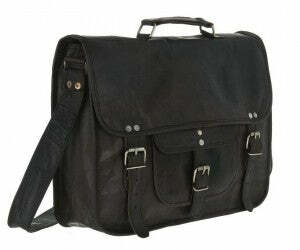 If you want to keep the present simple yet practical, this Large Black Leather Messenger Bag, £90, is the right choice. The sleek design can fit a 13” or 15” laptop, along with folders, books and whatever else is needed. The black leather looks great with anything and the whole bag oozes style – just the thing for a fussy recipient. We also have a range of sizes and colours of our leather messenger bags. 5. Finally, this Leather Duffle Bag, £170, really is the perfect bag. Whether used on a short holiday, a weekend away or even as a large gym bag, it is guaranteed to bring envy to everyone who lays eyes on it because of the beautiful suntanned leather and the detail and care put into the stitching. As well as this, the more it is used, the better it looks (if that’s even possible!) because the leather becomes softer and suppler until he won’t even think of leaving the house without it. See our other leather duffle bags here. 1. These Glass Earrings, £10, are perfect as a smaller gift. They go with practically everything and also have a matching ring. There is a large range of other jewellery available too. 2. Another great gift is this Small Ball Silver Ring, £30. It is sterling silver and comes in a range of sizes and looks great alone or with other rings – definitely a good one if you want a smaller present, but equally one that your partner will continue to wear. We have a large range of silver rings. 3. This Vintage Two Pocket Large Satchel, £65, is beautiful and brilliant. It can fit all your daily essentials; a bottle of water, mobile phone, iPad etc. and looks great with everything! From the beach to a muddy music festival, this is a great gift to give. 4. Another perfect present for your loved one could be this Black Padded Leather Laptop Bag, £120, which is fantastic if she’s constantly on the move with her laptop in tow. Fitting plenty of A4 documents and a 13” laptop in a bag has never been this stylish! 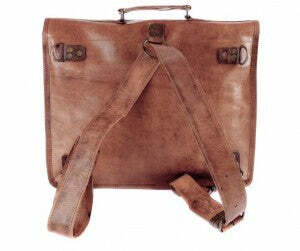 We also have a variety of tan laptop bags. 5. Last but certainly not least is the Extra Large Leather Weekend Bag, £195. I could go on about this bag for days (as you can see from my blog post about it ) as could just about every newspaper or magazine who have reviewed it! From Vogue to The Telegraph, this is one popular bag, and coincidentally it would be an absolutely fabulous Valentine’s gift, whether she would use it as hand luggage or just for a romantic weekend away. Whats The Ideal Leather Satchel For a University Student? I read this comprehensive review of our Large Lather Satchel and it got me thinking about how much money I wasted on cheap bags which broke. There are many things to remember to buy when heading off to university, but I strongly believe one of the most important investments is a sturdy, practical and fashionable bag to use. 1. 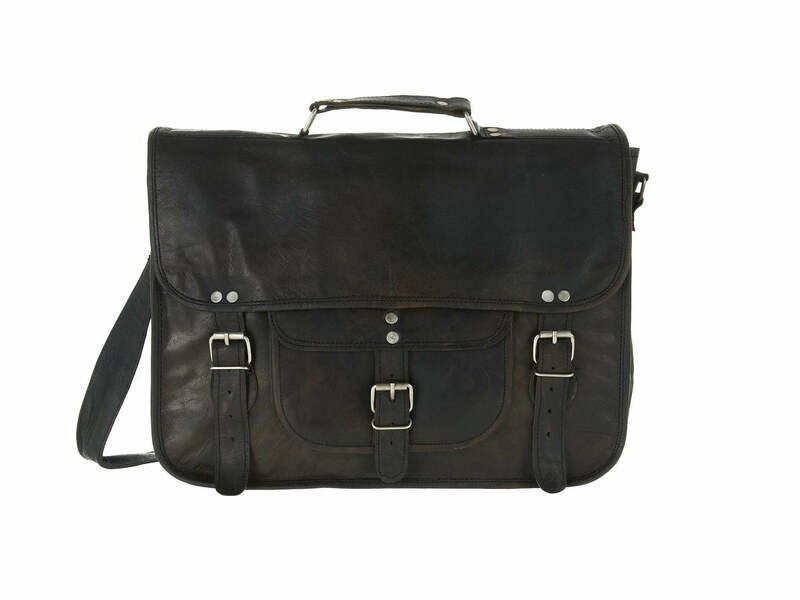 Medium Black Leather Messenger Bag – This beautiful black messenger bag is very popular among men as it’s simple yet cool and for a mere £80 it’s a bargain! It can be carried across the body and has three inside zip pockets for security and is perfect for university as it can comfortably fit an 11” or 13” laptop along with your books, phone, pens and anything else you may need while at your lectures. 2. Large Leather Satchel 3 in 1 Backpack – I love this bag and I’m sure many of you will too; it’s an extremely clever design as you can use it as a satchel, a rucksack or a briefcase – it’s the best of the best! If you cycle to your lectures, this is definitely the bag for you – use it on your back for your journey, then whip it over your shoulders while walking around. As well as all that it can fit 13” laptop in the internal sleeve or a 15” laptop and an A4 file in the main compartment – serious practicality as well a style. 3. Special Leather Laptop Bag Extra Large – This is another great leather satchel style bag, especially if you are one of those students who likes to carry everything with you. It has loads of pockets to keep all your bits and bobs completely safe and it can fit a 15” laptop as well as fitting a lever arch file, A4 documents and even a change of clothes or gym stuff. It has a hidden extra section (which can stretch to another 6cm on top of 14cm already!) which has easy access along with the main compartment which can be zipped up to keep your lecture notes extra secure! This is also a great multi-functioning bag as it can easily double up as a beautiful hand luggage bag or even just an original handbag whether you’re off on holiday or just going shopping. 4. Large Black Leather Satchel – This particular model has a handy front pocket and a sturdy top handle although you can buy this bag without the extras, although I think they add to the satchel’s originality and classic style. This bag can again fit a 13” or 15” laptop along with books, folders and everything else you need to get you to your lectures on time. I also think the black leather makes this one of the most beautiful and stylish satchels you can buy – you’ll definitely get some envious looks wandering around campus with one of these! 5. Grande Leather Laptop Bag – I like this bag with the tough top handle but no front pocket and I’m sure it will be the bag for you if you like your accessories minimal yet stylish and traditional with a modern twist. A 15” or 17” laptop can fit inside along with your books, documents and gym stuff, and we’ve recently added 2 large interior zip pockets so you can keep all of your valuables safe inside this beautiful leather bag – the perfect satchel for a stylish student! We were thrilled to be mentioned on the Hg2 (Hedonists Guide To…) website which named one of our small leather handbags as the perfect accessory to take to the amazing Port Eliot Festival (the next festival takes place 24-27 July 2014). This brilliant literature, music and visual arts festival, which was founded in 2003, takes place in St Germans, Cornwall. Although I’ve never been, the ‘festival of ideas’ (as called by frontman of Pulp, Jarvis Cocker) is well-known for a multitude of different acts, from spoken word artists to musicians, and with the festival full of fashion, food and the odd cabaret tent, it is definitely somewhere to consider next summer. The Grace Embossed Vintage Leather Satchel [LINK] was picked as the best bag to take to a festival and its easy to see why! As it is a shoulder bag, your hands are "free to grab some Pimms and dance the night away", and your valuables can be kept safely across your body. As for space, this bag has more than enough – your phone, purse, digital camera, sun cream, make up and gum will fit in easily. To top it all off, the beautiful leather goes with anything and everything, so you can use it when wearing jeans and wellies, along with a maxi dress one evening – the perfect festival bag! I wrote an article some months ago sharing my dismay at Chanel’s misbranding of their ‘satchel bag’ (which was not even nearly a satchel! ), and so while I was revisiting their A/W12 collection I was very surprised to find that lo and behold, Chanel had tried the satchel again. More surprising than this, was the fact that they had actually done my favourite bag justice. As far as satchels go, I am quite traditional and I think the best satchels are made with proper leather and classic style in mind. Saying this, Chanel’s satchel was quite good in my books, if not a little too busy for my liking. I thought, for the purposes of fashion (and hopefully for your entertainment), I would compare and contrast the Chanel ‘satchel’ with one from Vida Vida (below): [caption id="attachment_147" align="aligncenter" width="445"] Separated at birth? Chanel and Vida Vida[/caption] The most obvious difference is the material; Chanel’s bag is made of burgundy leather, which is quilted (oh, how original Chanel!) and rimmed with a lighter, shinier edge, unlike the beautiful suntanned brown leather of the Vida Vida bag, which has a subtle edge that is barely visible. Chanel uses a smooth and consistently tanned leather in contrast to the more relaxed vintage look of our leather which has different tones of gorgeous, rich brown. Then comes the handle; both Chanel and Vida Vida have metal hoops to link the handle and the satchel, but that appears to be the only similarity between the two. Chanel have used a thick metal chain, whereas Vida Vida have kept the traditional sturdy leather strap, and also kept the top handle small while Chanel made theirs larger, and more like the handle for a handbag. There is also the discussion of the shoulder strap; Chanel’s is made of the same leather as the detailing on the edge of the bag and the buckle straps, is adjustable and can be detached from the bag itself, so this satchel is more of a handbag. Vida Vida on the other hand have a thick, brown leather strap which stays attached to the bag constantly, but also has a buckle to adjust the length of it. Another difference is the design in the front of the bag; Vida Vida’s satchel has the traditional front pocket with the buckled strap in the same material. Chanel’s does not have a front pocket, but a panel, made in an entirely different material to the rest of the satchel. This panel also includes the iconic Chanel ‘CC’ lock. Also, Vida Vida’s straps have real buckles to do up the bag, whereas Chanel’s buckles are fakes with poppers underneath. Finally, what I think is the most important difference, the price; Chanel = £750+ Vida Vida = £75-£90 (depending on size) So, if you do not have £750 or more to spend, then please take a look at these lovely (understated and traditional) ladies leather satchels.